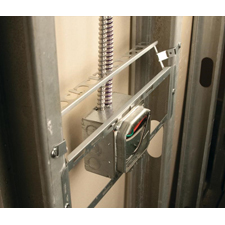 South Bend, Indiana November 13, 2018 - RACO introduces two new Open Center Brackets for electrical boxes. These patent-pending additions to the bracket line provides new options for positioning boxes in new construction. RACO, part of Hubbell Commercial Construction, provides innovative electrical products to commercial and residential markets. RACO's new lightweight bracket design positions electrical boxes, plaster rings or low voltage devices between studs. Bracket features a large opening that allows either 4in or 4-11/16in boxes to be mounted anywhere within the space. The design saves time during installation by allowing boxes to be mounted without a raised cover, providing maximum work area inside. The unique built-in "first means of support" helps secure MC cable that will be inserted into boxes mounted to the bracket. A built-in ruler on the bracket aides in aligning boxes. Made of galvanized steel, RACO Open Center brackets are perfect for commercial construction. These new brackets provide maximum flexibility for installers. Two UL Listed models are available, 9016R for 16in stud spacing and 9024R for 24in stud spacing. They can be used on wood or metal studs that are 2-1/2in to 3-1/2in deep. Availability of RACO Open Center Brackets begins during 4Q18. Find more information at www.hubbell.com. Hubbell Commercial Construction includes five brands that provide innovative and cost-effective electrical products with superior customer service for commercial and/or residential markets. RACO creates electrical boxes, covers, and fittings. TayMac crafts in-use covers for outdoor electrical applications. Bell produces weatherproof boxes, covers and outdoor lighting. Wiegmann offers the most complete line of electrical enclosures for OEM, Commercial Construction, and MRO markets. Acme Electric manufactures power conversion and conditioning equipment for industrial, commercial and OEM applications. These historic brands are part of Hubbell Incorporated, one of the largest electrical manufacturers in North America. The company's history of innovation extends back to 1889. Founder Harvey Hubbell invented the pull chain light switch and electric plug.